when JFK was shot? ", "Where were you when the towers fell? ", or this week, "Where were you when Michael Jackson died?" I was in the dance studio, teaching. One of my students received a text message and announced that Michael Jackson just died. We thought he was kidding at first. How could Michael Jackson be dead? Other than preparing for his big comeback tour in Europe, he hasn't even hardly been in the news lately. It's Farrah Fawcett and Ed McMahon that have been sick, not Michael Jackson. But sadly, it was true. The pop icon had been rushed to the hospital after cardiac arrest and never recovered. Word is still out on the exact cause of death, but regardless of the outcome, the singer is still a crossover legend - Motown, pop, hip hop, Hollywood, and the dance world have all changed because of this one eccentric man. As I write this, I am listening to my old "Thriller" cassette and the memories are flooding back. When I think of icons of my childhood, Michael Jackson jumps to the front of the list. I'm surprised this cassette is even still playing since I listened to it so many times back in the day. I can still remember sitting wide-eyed in front of the TV as he floated across the floor in his signature moonwalk. There was something about his movements that always just arrested me. He almost didn't even look human on that stage. He defied gravity. He rocked a nation. He ignited millions of imaginations and he changed the world of music and dance forever. He had his issues and he had his mysteries that we will probably never solve, but no one can deny that the man also had incredible talent. It is hard to imagine a world without the creator of Billie Jean, but his legacy lives on in the hearts of every musician, every dancer, and every person who has ever dared to dream big and dream different. May he rest, finally, in peace. 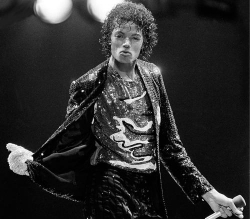 For more on Michael Jackson's influence in the dance world, keep reading.